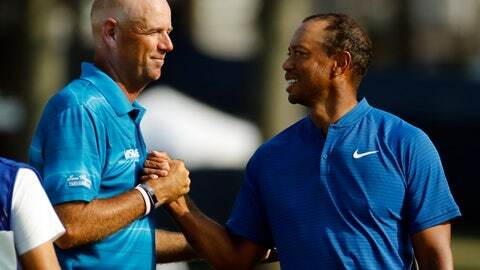 ST. LOUIS (AP) — Stewart Cink felt as if he’d traveled back in time on Saturday, playing with Tiger Woods and all that entails — the massive crowds, the raucous cheering and the mind-bending intensity. “Kind of reminded me of being in the vortex a lot of years ago,” Cink said with a smile. It wasn’t just playing with a rejuvenated Woods, though. The 45-year-old Cink played a lot like he did in his younger days, shooting a 4-under 66 in his third round at the PGA Championship to climb into contention heading into the final round at Bellerive Country Club. Cink was one of the best players in the world a decade ago, winning six times on the PGA Tour over the years. But he hasn’t won since capturing his only major, when he triumphed over the seemingly ageless Tom Watson in a playoff to win the 2009 British Open at Turnberry. Cink had only made 13 of 18 cuts this year, though he did tie for second at the Travelers. He was also in the top 5 the week before that at the St. Jude, a sign his game was rounding into shape. It helps there are plenty of similarities between Bellerive and his home course of East Lake Golf Club in Atlanta, ranging from the zoysia fairways to the soft greens.